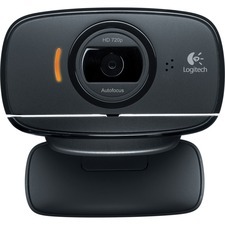 With HD 720p video calling and recording as well as one-click HD uploading to Facebook, you can use the HD WebCam C525 to share your HD world anywhere, anytime. Logitech Fluid Crystal Technology automatically adjusts the frame rate, color and sharpness for smoother video, sharper pictures, richer colors and clearer sound in real-world conditions. With auto light correction, the camera will intelligently adjust to produce the best possible image even in dim or poorly backlit settings. Enjoy wide-screen HD video (720p) on major IMs that support HD video calls. This webcam doesn't compress video during a call so your image stays HD-clear. Foldable webcam also features a built-in premium autofocus for razor-sharp images, 8 megapixels for high-resolution snapshots (software enhanced), built-in mic with noise reduction for clear conversations and face-recognition software. The 360-degree, full-rotational design makes calling and recording easier at any angle.